The interiors of the Bolshoi Theater have become the most recent addition to Google’s initiative to digitally record the world’s art. On Feb. 10, the theater’s administration and the Google Cultural Institute unveiled a virtual 3D tour of the historic building, its new stage and three digital exhibitions from the collections of its museum. RBTH spoke to Carlo d’Azaro Biondo, President of Southern & Eastern Europe, Middle East and Africa Operations at Google, Inc., about why the world’s biggest search engine is spending vast sums of money on digitalizing world art. RBTH: What was the concept behind the Cultural Institute? Carlo d’Azaro Biondo: The concept was born with Amit Sood, current director of the Cultural Institute. He was the first one who started to say that he wants to put museums on the web. We had dinner and started thinking that we were worried that local cultures - France, Italy, Spain, the Middle East, Russia - are not so widely presented on the web like Anglo-Saxon one. The goal of the Google Cultural Institute, as stated by Google itself, is to help preserve and promote culture online. To achieve this, the Institute partners with numerous institutions, theaters, museums and foundations to digitalize their artifacts and interiors and expose them in a virtual museum. So we started. At first museums didn’t want to come because they said “if we put a museum on the web, people will not go to the museum.” Our answer to that was - what is the most famous digitalized work of art in the world? [La] Gioconda, Leonardo da Vinci. But what is the most visited work of art in the world? The same Gioconda. Over time we proved that the more you put on the web, the more people want to see the reality. I think in the modern world it’s a sort of advertising. By putting the Bolshoi on the web I think we told the whole world about it. 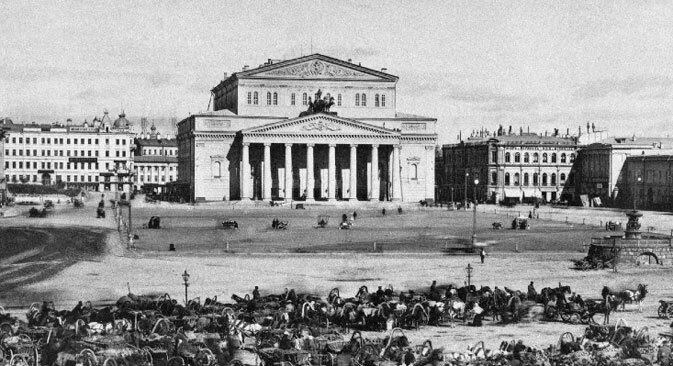 The more you hear about the Bolshoi, the more you want to go to the Bolshoi, the more you want to see ballet, the more you want to listen to opera. I’ve never heard of a single case in which receiving promotion on the web or elsewhere diminished your value. It always increases it. RBTH: Does Google show any context ads from museums and theaters next to this content? C.B. : No, we don’t show [anything] there. Not everything you do has a direct impact on money, but you also have social responsibilities… …We want to provide information in a way which is useful for the people. For now we haven’t found a way to monetize this. If in the future we find such a way, it will be beneficial to our partners. RBTH: What’s the audience of such projects? C.B. : A lot of people. On the art project where we have paintings it’s millions of people. Now we have 1.5 million paintings, 620 museums, and 150 works of art available in high definition. RBTH: Do you do it personally? C.B. : Not all of my evenings. But sometimes I come back home, take a cigar, a bottle of red wine, I put some classical music on. I sit with my wife and we browse on TV different works of art. We can do it for two or three hours. Because… where can you find 65 Renoirs? 42 Van Goghs? It’s difficult. RBTH: You’ve said that the Bolshoi eagerly agreed to make this collaboration. But did you have any difficulties negotiating with other institutions? Which ones were the most challenging? C.B. : The most challenging are always the ones which include modern art. Sometimes the museum didn’t have the rights for the web for all the artists. The mentality needs to evolve as well. And the artists need to see that this is promotion for them. RBTH: Do you have any plans to release these 360-degree cameras as consumer products? C.B. : That’s a good idea. I have to talk about it with the engineers. I would love to have a camera like this and do my own 3D panoramas. RBTH: So how much does it cost to digitalize a theater? C.B. : I’m not authorized to say how much the whole project costs. Digitalizing of painting in super-high definition can cost - depending on the painting and the tools we need to use - from 10,000 to 50,000 euros. RBTH: Tell me more about the people who are doing it. Are they Google employees? C.B. : We have a center in Paris with 20 engineers who work on the technology for 3D capture for Street View. For high-level detailed editions of paintings we create those technologies. They do this full-time. And they are passionate about it. To take pictures we use other Google employees, local ones. They learn how to use the machine and do it. Otherwise, we couldn’t do it with 20 people. Lots of Googlers contribute their free time to it. RBTH: What are the next things you want to digitalize? C.B. : Well, not to spy there. We think it’s interesting to show anything that can make Russia more understood abroad. Churches, museums, modern art in Russia, street art. I think there are no limits. Give us ideas, and we’ll do it. We try to make everything we can to make the cultures understood and represent the world. RBTH: A small museum can approach Google and ask for the digitalization of their archives? Unique photos and old costumes of 1880-1910 and can now be viewed online - on the Google Cultural Institute website. C.B. : Yes, they do. We have 600 museums, of which 400 are small museums. If you are a small museum in Russia, and you want to be seen, be on Google, so people will find and see you. It should help to attract more people. RBTH: Where can they apply? C.B. : There’s a cultural institute website where museums and people can go. Today is the year of literature in Russia. I hope we can make something for the year. Russian literature, like ballet, is one of the most famous in the world. Bringing Russian literature on the web - we would love it this year. RBTH: How do you integrate all of this with other Google services? Google Cardboard? C.B. : Cardboard was actually developed in the Cultural Institute lab. You can view Versaille in virtual reality with Google Cardboard. We now want to put it on the phone so that it would work better on an Android, through a native app. Personally I would love everything to be on maps. Why? Because it’s convenient for travelers. If I’m in Moscow, and from the map I can see these paintings, it will make me go and see them in real life.